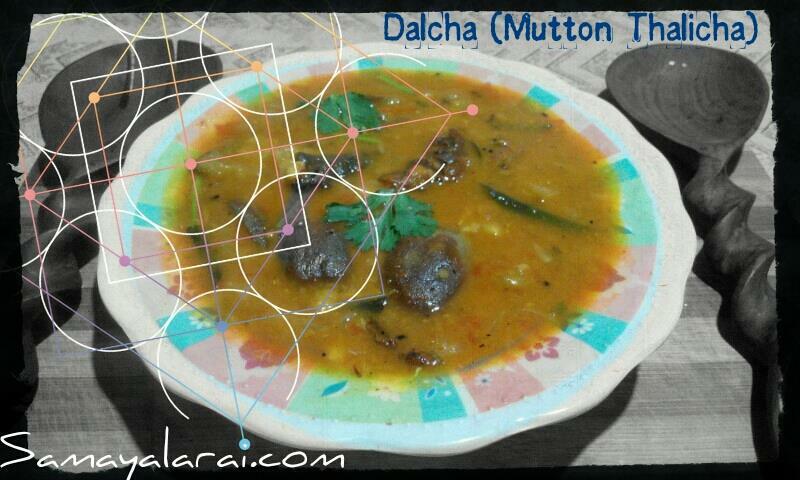 Clean and Pressure cook Mutton with ginger garlic paste, Thoor Dal (thuvaram paruppu), Chenna dal (kadalai parupu), turmeric powder and with sufficient water. And Keep aside. Heat Ghee in a pan, saute dry red chillies, onion (or Shallots) tomatoes, clove, cinnamon, curry leaves and brinjal. Pour less water, for the vegetables to be cooked. When vegetables are soft, add the cooked mutton Dhal, chilli powder, dhaniya powder and salt (or use our home made sambar powder-4tsp) and tamarind pulp. Leave it to boil, in low flame. Dalcha should be thick. Dole our hot with Biriyani or with Rice or with Idly/Dosai.